Brison Ricker attended the festival for a short time last Saturday. Post photo by J. Reed. 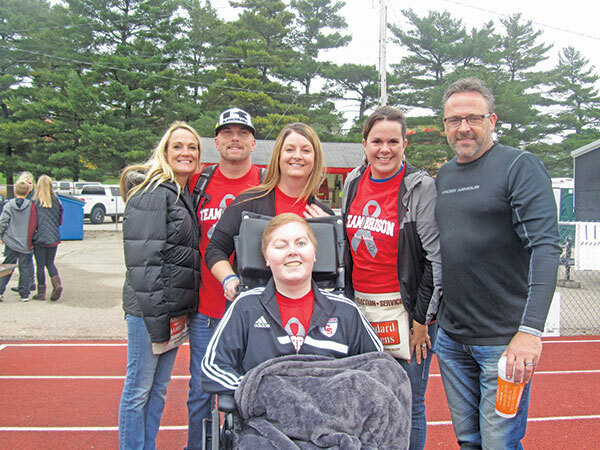 Last weekend’s Music Festival and Family Fun and Games event at Skinner Field in Cedar Springs raised $9,000 for Brison Ricker, a Cedar Springs High School student diagnosed with an inoperable brain tumor. The event featured several live bands, a peek inside a hot air balloon, games for kids, a cake walk, a dunk tank, a baked good sale, silent auction, many items that were raffled off, concessions, and a lunch provided by The Grilling Company. The event was organized by teen Kevin Galloway, and Perry Hopkins, owners of Perry’s Place. Galloway wanted to do something for Brison, and approached the CBDT last summer, and Hopkins, who is part of the CBDT, then worked with him to plan out the Festival with the help of Team Brison, the group helping to fund medical treatments for Brison through various events. Hopkins said he was pleased with the turn out, despite the weather. Brison has been undergoing alternative medical treatments to treat his DiPG, after conventional medical treatments failed. The treatments appear to be working, but cost $17,000 a month and are not covered by insurance. For anyone who would like to donate to Brison, you can visit his gofundme page at https://www.gofundme.com/brisonricker.